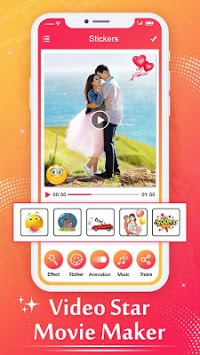 Video Star Movie Maker can help you create video. Create your own Photo Video - slideshow video from images and music with latest added features and theme. 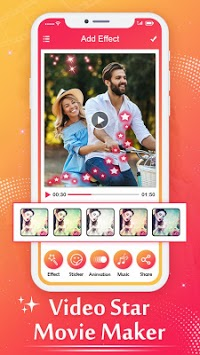 Video Star Movie Maker is application for creating video from Images and Music. It’s totally free and be forever. Video Slideshow Editor is the easiest way to create, edit and share amazing photo music videos and stories. 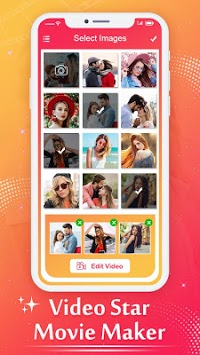 Video Star Movie Maker is easy to used and make best video maker story from your celebrate photos from choosing gallery or album. You have to arrange birthday photo according to your slideshow maker at time of choosing and to add music related to your video story maker. - Add up to 100+ photos to create a Photo slideshow!. -Stylish & Fashion mode Real-time Filter effects. -Adjust the Position with drag and drop. -Decorate your video with awesome stickers and frames. -Set Time(2s ,4s, 6s ,8s ,....etc) in Frame between photos in video. -Apply beautiful overlay to your all of your photos. -Easy process to create amazing video from photos. -You can see all your video in my work screen. -Share video to your favorite apps with you friends and families instantly.